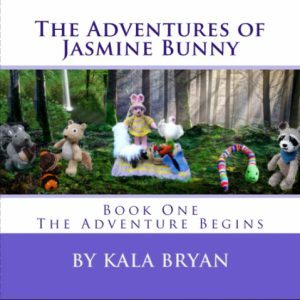 The Adventures of Jasmine Bunny began as a tale for my granddaughter with characters knit by me as a birthday gift for her third birthday. It is a tale about a little bunny who lives in Awbrion (an anagram of Rainbow) with all of her little forest friends. She has a brother, Jasper, who has gone off to see the world on his own adventure. During a game, she loses her hat in the river and is swept away on the current to a different land where she meets strange new friends. She learns that Jasper could be a prisoner of the evil Zargon so she decides to go after him. In this first installment of The Adventures of Jasmine Bunny, you will get to know Jasmine and her friends and become a part of her adventure as she goes off in search of her brother, Jasper.